Soundtrack// THOU – “Baton Rouge, You Have Much to Answer For” — it’s been all Thou recently after reading ZEITOUN by Dave Eggers so I can teach it in the fall. Hell, it’s been all Thou for the last half a year. Please just check them out at http://noladiy.org/thou and download some of their music (the band offers almost all of it for free) and check out the lyrics. Mood// Pissed off but hopeful …. see above for reasons why. This is a SUPER easy recipe if you’ve got the seitan prepared already. And if you don’t it’s still pretty easy but takes a bit longer. The spicy orange sauce is one of the easiest sauces you’ll make on your own but it’s one of the tastiest, thanks to Carrie’s Vegan Fire & Spice book, which after 7 months into the 2010 season I believe is still batting 1.000. 1. Whisk together the wet ingredients (+garlic) in a measuring cup. NOTE: If you use the veggie broth cubes like me and therefore have to use boiling water, make sure to do this a few minutes ahead of time and stick the broth in the freezer to cool it off while you mix the dry ingredients. 2. In a larger bowl mix the dry + spices. If the liquids are cool then pour into the dry and stir with a spatula. Knead for a few minutes. Let it rest for 10 minutes and knead again for another 30 seconds. While you’re waiting, get about 3 inches of water boiling inside the pot and stick the strainer inside the pot so it sits above the water but not touching it. 3. Placing dough on a cutting board, cut it with a sharp knife into 4 roughly equal pieces and knead a few more times. 4. Now here’s where the book and I differ a little. I’ve had more luck flattening each piece, instead of shaping them into a “loaf.” You can try whatever you want but I think it cooks easier flattened just a tiny bit. To do so, place each piece on some tin foil and wrap it by taking the short sides, folding them over, then rolling the dough inside the foil length wise. 5. Place each bundle of seitan dough inside your strainer and cover the pot so not a lot of steam escapes. Again, the book says to cook for a half hour, but it takes close to an hour for me. Check occasionally after the initial half hour. The dough should be firm and fully formed, able to be sliced easily. 6. Let each piece cool and either use immediately or store in the fridge. 1. Heat the oil over medium-high heat and stir fry the seitan until browned on each side. Throw broccoli in. 2. 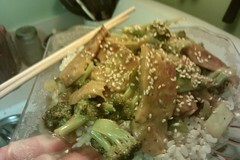 Mix soy sauce, garlic, brown sugar, chile sauce, and orange juice in a measuring cup and add to seitan/broccoli. 3. Cook for several minutes until it starts to thicken, then add the cornstarch mixture and cook for several more. Now you can add the chopped scallions so they cook down a little during the last several minutes. 4. Serve over brown rice, sprinkle with sesame seeds, and reject the idea you HAVE to get take out tonight.